Rodney George "Rod" Laver AC, MBE is an Australian former tennis player widely regarded as one of the greatest in tennis history. He was the No. 1 ranked professional from 1964 to 1970, spanning four years before and three years after the start of the Open Era. He also was the No. 1 amateur in 1961–62 according to Lance Tingay. 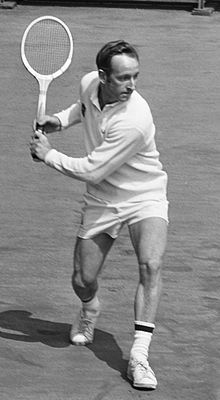 Rodney George "Rod" Laver AC, MBE (born 9 August 1938) is an Australian former tennis player widely regarded as one of the greatest in tennis history. He was the No. 1 ranked professional from 1964 to 1970, spanning four years before and three years after the start of the Open Era. He also was the No. 1 amateur in 1961–62 according to Lance Tingay. Laver's 200 singles titles are the most in tennis history, and he holds the all-time male singles records of 22 titles in a single season (1962) and seven consecutive years (1964–70) winning at least 10 titles per season. He excelled on all of the court surfaces of his time: grass, clay, hard, carpet, and wood/parquet. Despite being banned from playing the Grand Slam tournaments for the five years prior to the Open Era, he still won 11 singles titles. He is the only player to twice achieve the calendar-year Grand Slam, in 1962 and 1969, and remains the only man to do so during the Open Era. He also won eight Pro Slam titles, including the calendar year Pro "Grand Slam" in 1967, and contributed to five Davis Cup titles for Australia during an age when Davis Cup was deemed as significant as the Grand Slams.